IAB Belgium is organising an IAB Atelier on Mobile Marketing on March 18th. Danny Lein, CEO of MobileWeb will be one of the keynote speakers. Is your company ready for this mobile revolution? How should you develop a performing mobile marketing strategy and how should you integrate it into your global strategy? How to use mobile apps best? And how to measure the performance of mobile marketing campaigns? During this Atelier you’ll learn more on the Belgian mobile marketing landscape and the opportunities offered by mobile marketing. The experts will explain the do’s & don’ts when developing and measuring mobile strategies and campaigns. This seminar is targeted at marketeers who want to discover the specifics and challenges of mobile marketing and who want to develop brand supporting actions. Subscribe here – limited places. Dutch news site Nu.nl reports a shift of web traffic from their mobile website to their mobile apps for iPhone and Android. 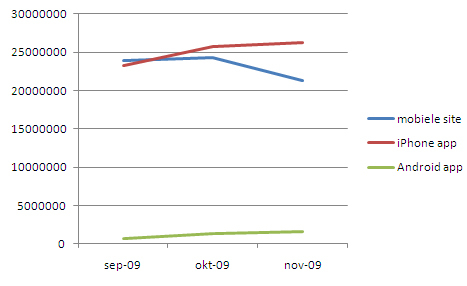 In November, the traffic on the Nu.nl mobile site saw a 20% decrease to 20 million pageviews. However, traffic on their mobile applications saw a rise. The iPhone app is by far the most popular; numbers for Android are still rather insignificant. In the Netherlands, about 2,5 million people log onto the Internet via their mobile phone every month. About half of all mobile phones sold with a subscription is a smartphone. m.datanews.be, the recently launched mobile site of DataNews, was entirely developed by MobileWeb.be, Belgian specialist in Mobile Internet and SMS solutions. The site is optimized for iPhone, Blackberry and other smartphones. With the addition of Datanews’ mobile site, MobileWeb further grows its portfolio of mobile media, which also includes the mobile sites of De Standaard, Het Nieuwsblad, Jobat, VDAB, Nikon and Stad Gent. Belgian ICT magazine DataNews selected MobileWeb.be as their preferred partner to further build their mobile strategy. Since the target audience of DataNews is technologically advanced, it was important that different smartphone users can access the mobile site. MobileWeb’s Mobile Internet platform allows full compatibility with different types of mobile phones, which garantees a superior user experience on the iPhone and Blackberry, as well as other mobile devices with Internet access. While m.datanews.be focuses on ICT news in Dutch and French, the mobile user can also consult ICT job offers, extensive product reviews and an agenda of ICT events. With m.datanews.be, MobileWeb.be further builds its Mobile Internet portfolio, which includes the mobile sites for De Standaard (m.standaard.be), Het Nieuwsblad (m.nieuwsblad.be), Jobat (m.jobat.be) and VDAB (m.vdab.be). Several mobile marketing sites were created, among which are campaigns for Nikon and Stad Gent. Earlier this month, MobileWeb.be also presented the iPhone app for De Standaard, the first paying news application in the Benelux.